The FIFA World Cup is an international association football competition contested by the senior men’s national teams of the members of Fédération Internationale de Football Association (FIFA), the sport’s global governing body. It’s been awarded every four years since the inaugural tournament in 1930, except in the war years of 1942 and 1946. The next tournament takes place this year in Brazil, but preparations are not proceeding well and much of the unrest in Brazil at the moment was kicked off by revelations about the cost of hosting this tournament, and the Olympics in 2016. Football is the worlds most popular sport and the World Cup finals are a sporting event unrivalled anywhere. It was said that the 2010 World Cup finals were watched by a cumulative 26 Billion people, around 400m per match, with the final watched by over 700m people. Interest is almost universal with each of the 32 attendees fighting through a group stage and then knockout rounds to win sports biggest prize. The 19 World Cup tournaments have been won by eight different national teams. Brazil have won five times, and they’re the only team to have played in every tournament. The other World Cup winners are Italy, with four titles; West Germany, with three titles; Argentina and inaugural winners Uruguay, with two titles each; and England, France, and Spain, with one title each. 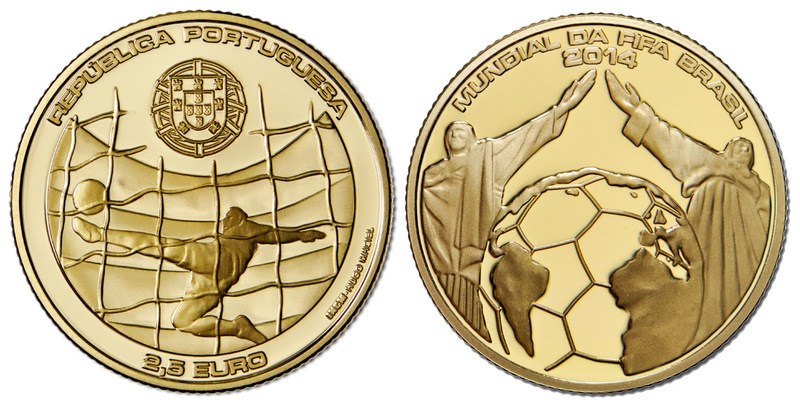 Coins remain a popular way to commemorate the biggest sporting events, but there remains a complete lack of co-ordination in getting the appeal to those people who currently don’t buy numismatics. Hopefully this guide will help newcomers see what’s available. Tabs with a * on them are newly updated. The two curved coins are the show-stoppers of the range. Very similar in size and shape to the smash-hit Baseball Hall of Fame coins from the United States Mint, the gold and silver coins have the same diameter but are different in weight because of the denser nature of the former. Both are superb looking pieces and if there’s any justice they’ll be big hits. The Football World Cup™ or FIFA World Cup™ is an international football competition taking place every four years. It was created in 1928. It is open to all national teams recognized by the Fédération Internationale de Football Association (FIFA). 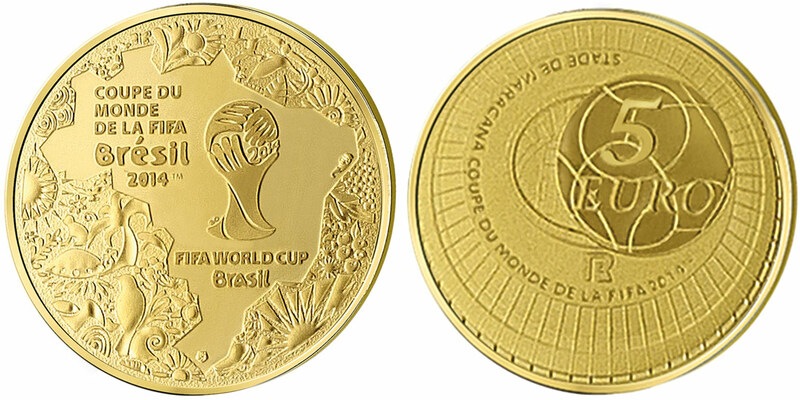 This year, the graphic concept combines two different elements : the representation of Brazil and of the Maracanã stadium magnified by the use of the dome shape striking on the two 37mm coins (1 Oz gold and €10 Silver). 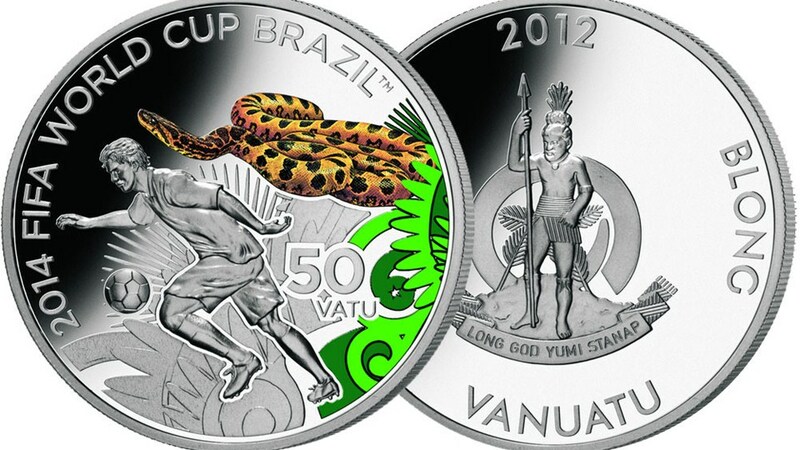 OBVERSE: depicts a map of Brazil delimited by stylized elements of flora and fauna. In the middle of the country map, the competitions logo and official name are represented. 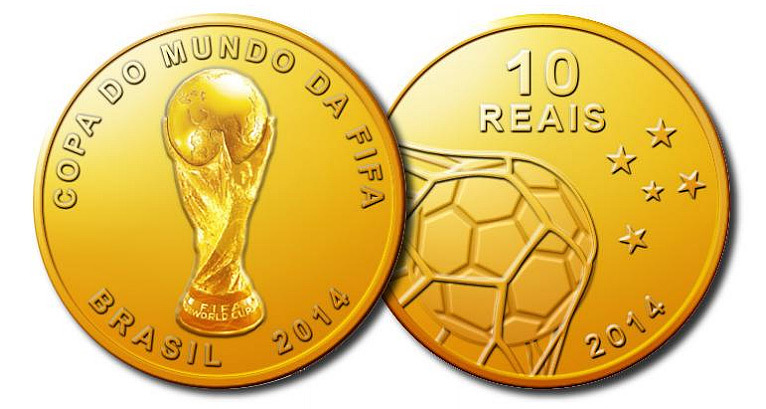 REVERSE: represents the Maracanã stadium in aerial view. The name of the stadium, the name of the competition and the RF mention are inscribed on the roof of the stadium. On the foreground, a ball on which the face value is written, springs from the stadium. The flagship coin in the range, if not the attention seeker, this huge and pricey €8,775 ($12,200, £7195) coin isn’t curved like the 37mm ones, but with a mintage of just 99 pieces, it’s a desirable piece regardless. Like the big five-ounce beast, the quarter-ounce coin (above) and the half-gram coin (below) are both flat. 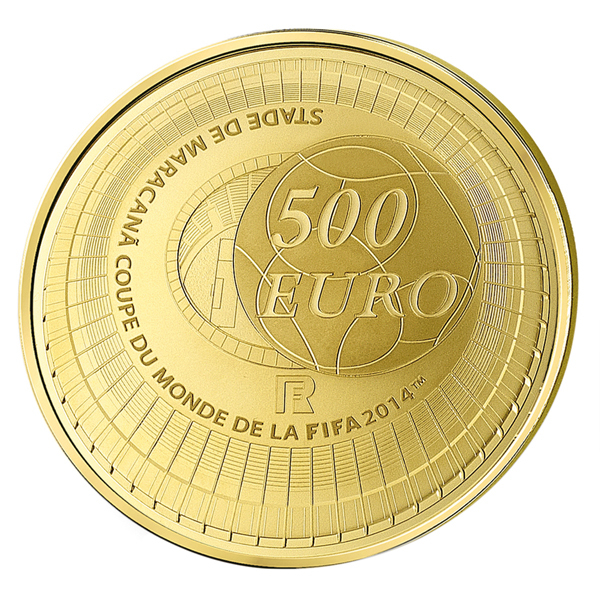 The 1/4oz also has the distinction of being the only gold coin not struck in 0.999 gold, instead being struck in a European favourite, 0.920. The former retails at €440 ($612, £361) and the dinky little 0.5g round at a wallet friendly €66 ($92, £54). The host nation has released a plethora of new coins, but six of them are cupro-nickel which we don’t cover here at AgAuNEWS. 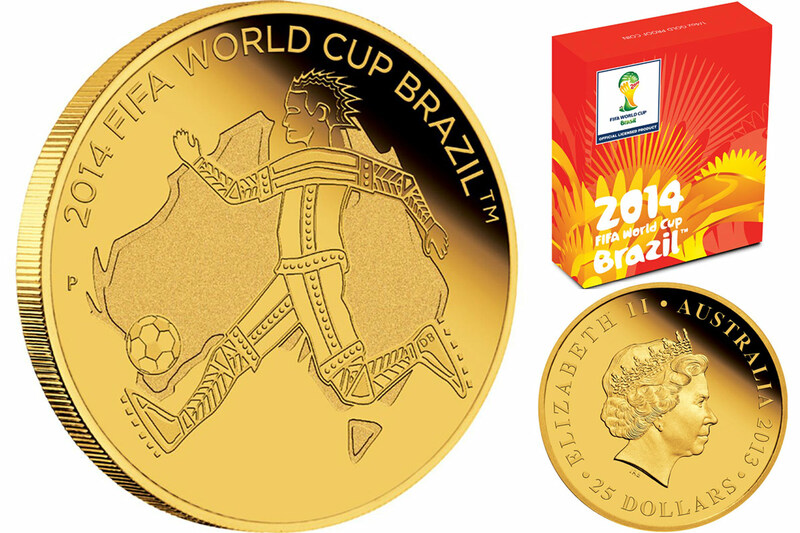 What’s left are a gold coin showcasing the trophy, and a pair of silver coins. All seem very well done and each is packaged in a nice snapper box with an illustrated shipper sleeve. 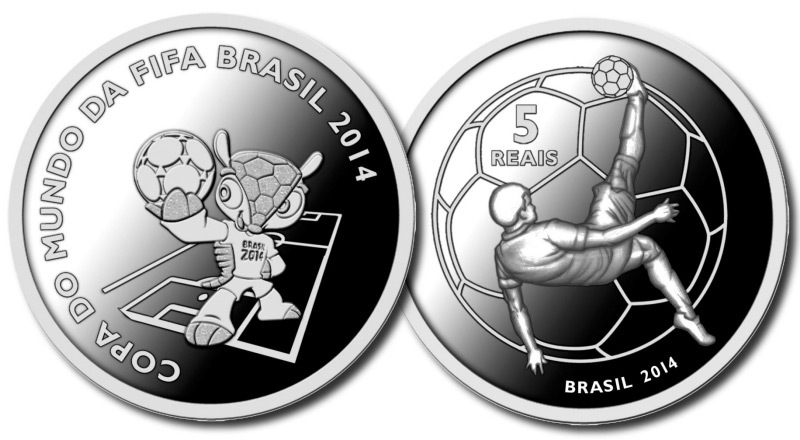 REVERSE: Depicts a player doing an overhead kick with the denomination at top-left and the inscription ‘BRASIL 2014’ at the bottom. REVERSE: Depicts a ball at full flight into the net to the right of which is the Souther Cross constellation so usually associated with New Zealand coins.The denomination is at top and the inscription ‘2014’ at the bottom-right. 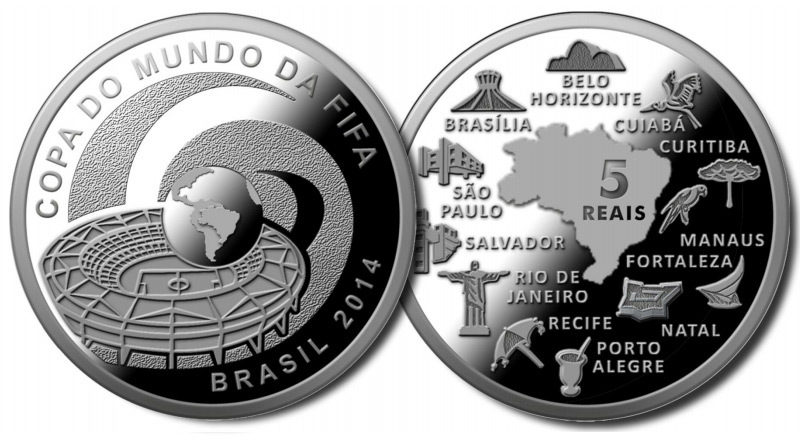 REVERSE: Depicts a map of Brasil and images representing all twelve of the locations where the games will be played. The name of the city sits beside an image that most closely represents it. The denomiantion is inscribed on the map in the centre. Just a single coin from Kazakhstan but a nice dynamic design. 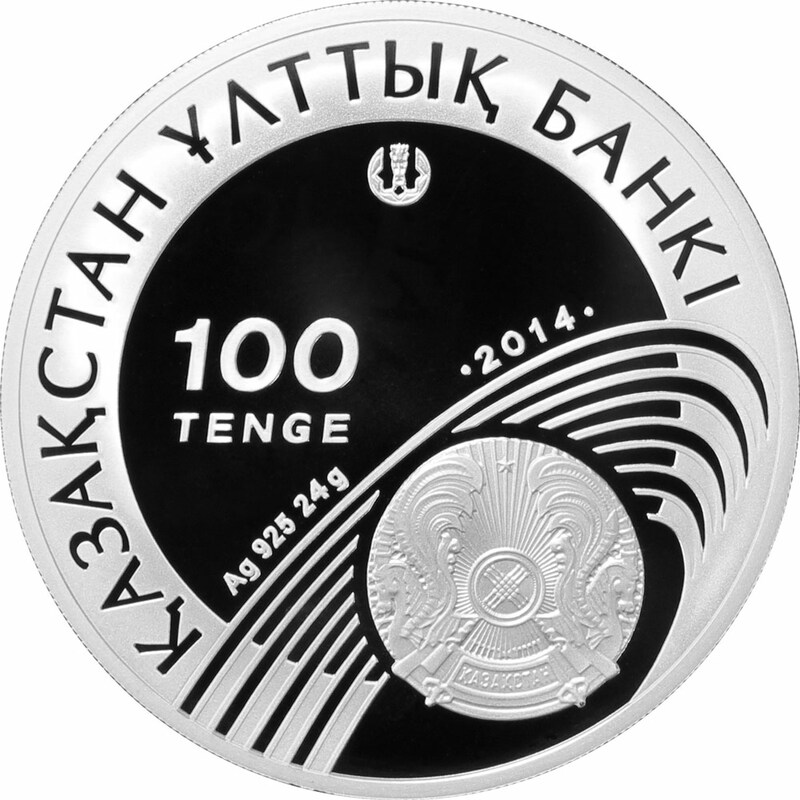 Struck in sterling silver, this 3/4oz coin was designed by A. Akhverdian and D.Abylkasimov and has a reeded edge. Surprisingly low-key from a high-profile mint, they released a 2012 dated 0.5g gold and 1/2oz silver, along with a 2013 dated 1/4oz gold carrying the same design. Done in an aboriginal style against a backdrop map of Australia, it’s a very stylistic approach to the subject that has favoured Australia over the host nation, Brazil. 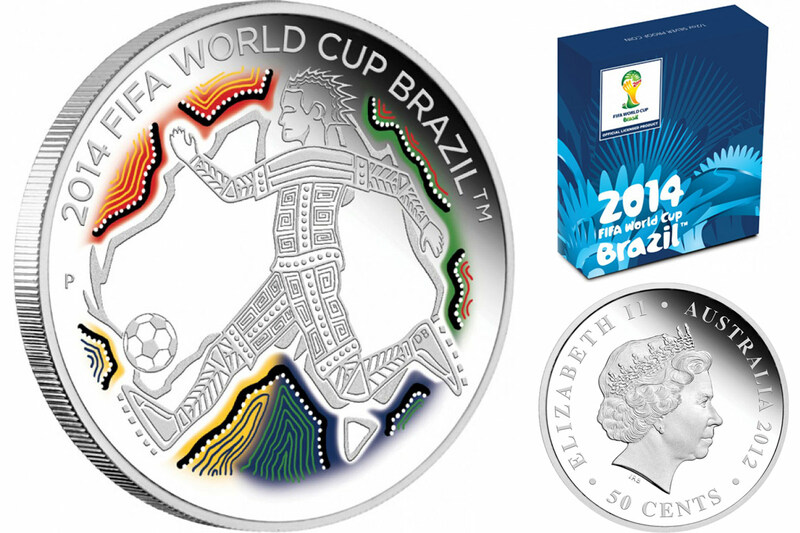 REVERSE: Depicts a representation of a soccer player featuring an Aboriginal motif. The background features a map of Australia. 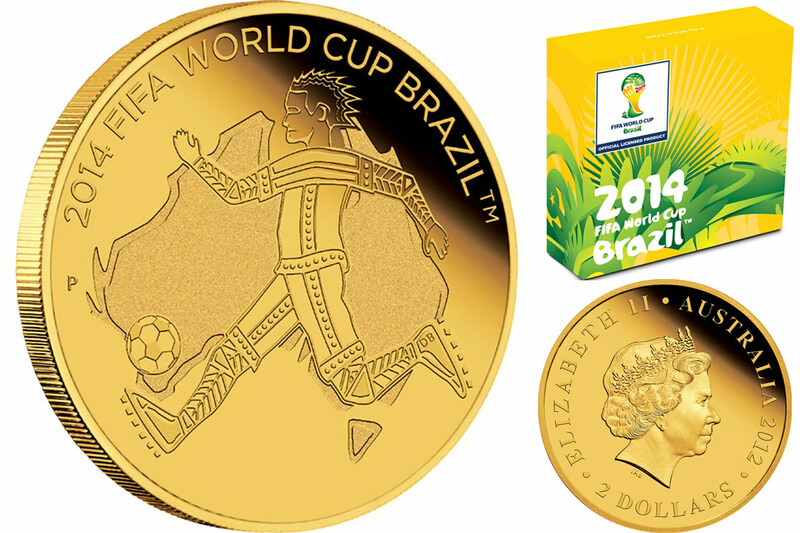 The design also incorporates the inscription 2014 FIFA WORLD CUP BRAZIL™ and The Perth Mint’s ‘P’ mintmark. OBVERSE: Depicts the Ian Rank-Broadley effigy of Her Majesty Queen Elizabeth II, the year of issue and monetary denomination. 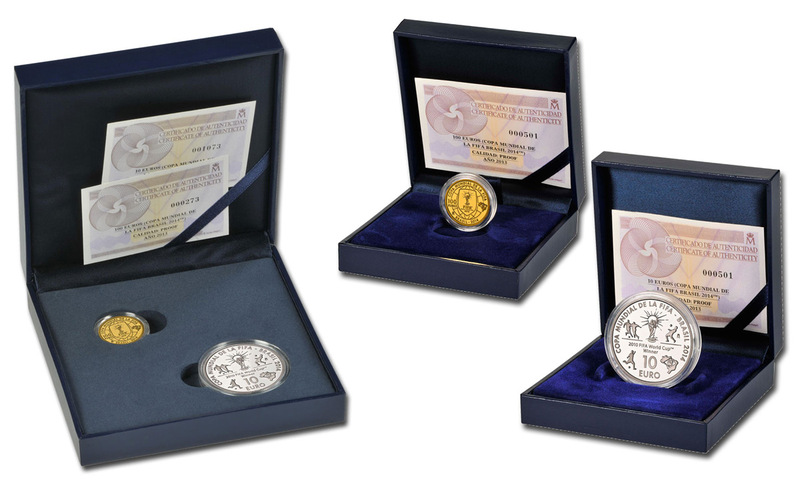 PACKAGING: Each coin is presented in a prestigious display case and shipper that includes a specially designed numbered Certificate of Authenticity. Just a pair of coins from the Spanish Mint issued in 2013, but they have different reverse designs. 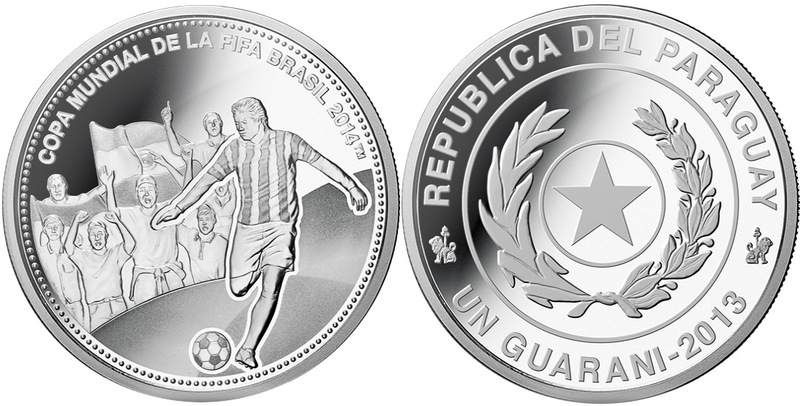 The silver coin commemorates Spain winning the 2010 FIFA World Cup as they go to Brazil as the defending champions. 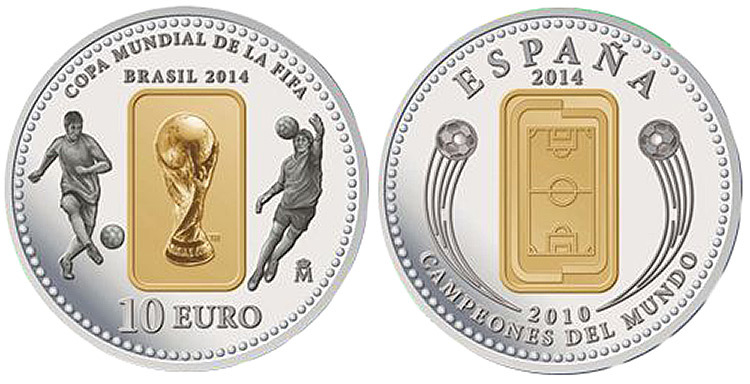 The gold coin is a more integrated design but also celebrates Spains 2010 win rather than the event in 2014. 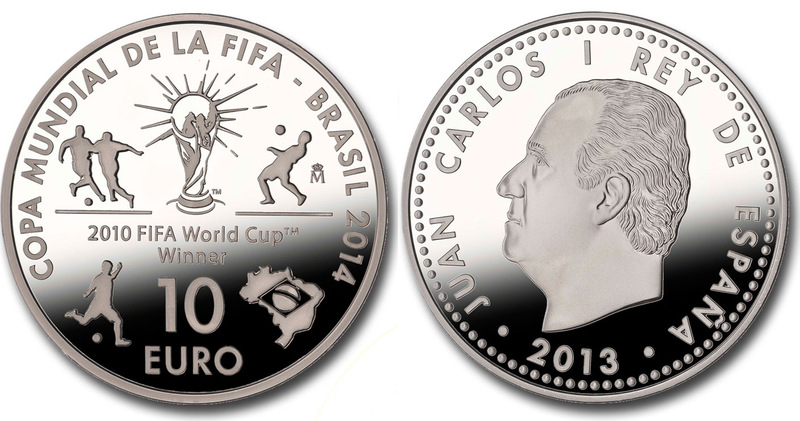 OBVERSE: Depicts a silver effigy of HM King Juan Carlos I around which is his name, description and date (2013). 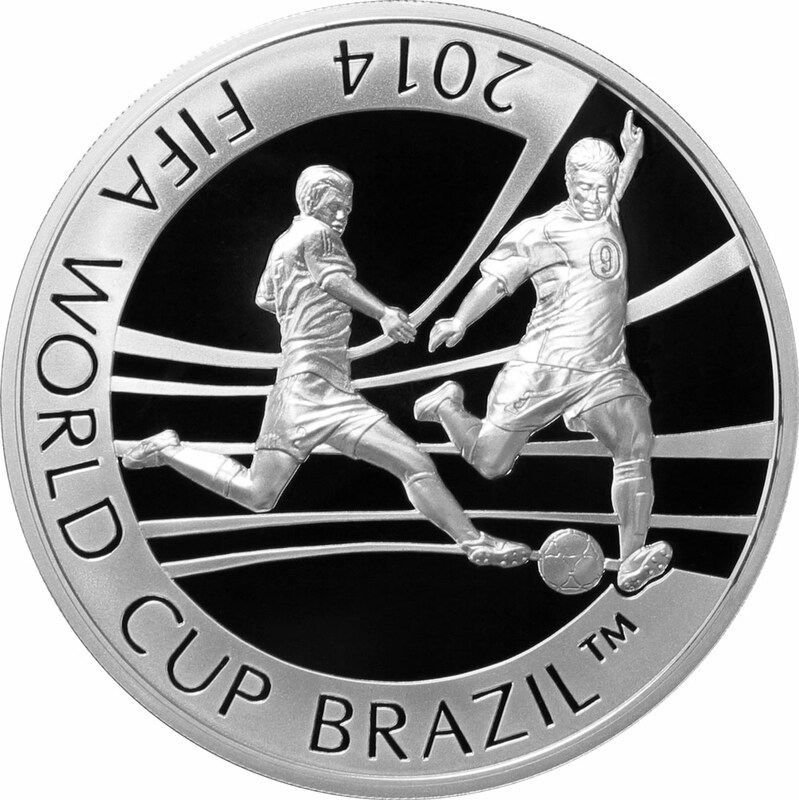 SILVER REVERSE: In the upper half of the coin in the centre is the World Cup Trophy; left, a scene with two players and to the right, a scene with a football player chesting a ball. 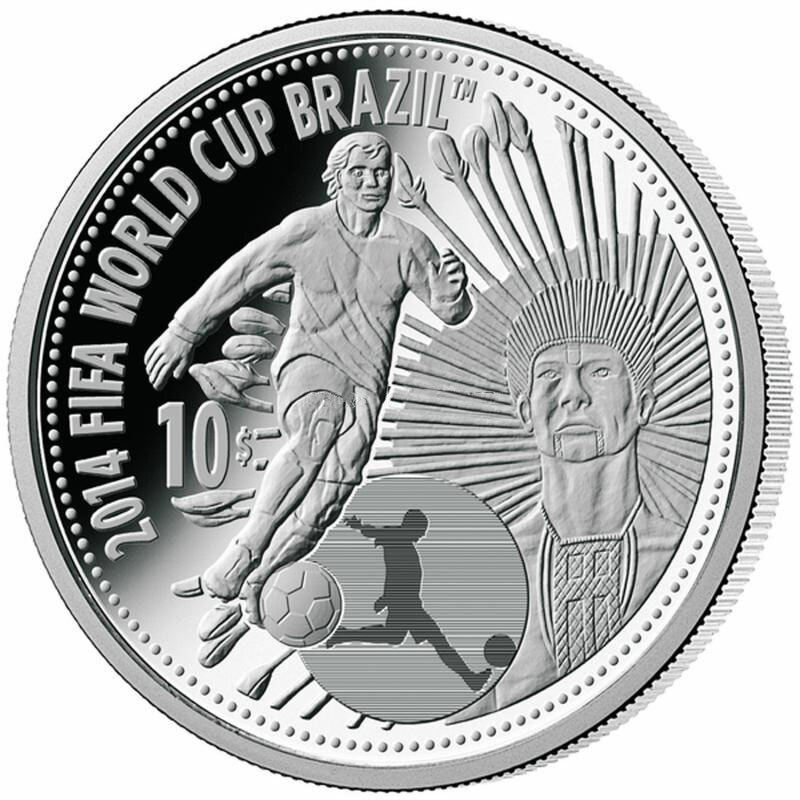 In the lower half of the coin, the 2010 FIFA World Cup ™ legends and Winner. Below is a scene from a football game, and the diamond and the celestial sphere contained in the Brazilian flag on a map image of this country shown. 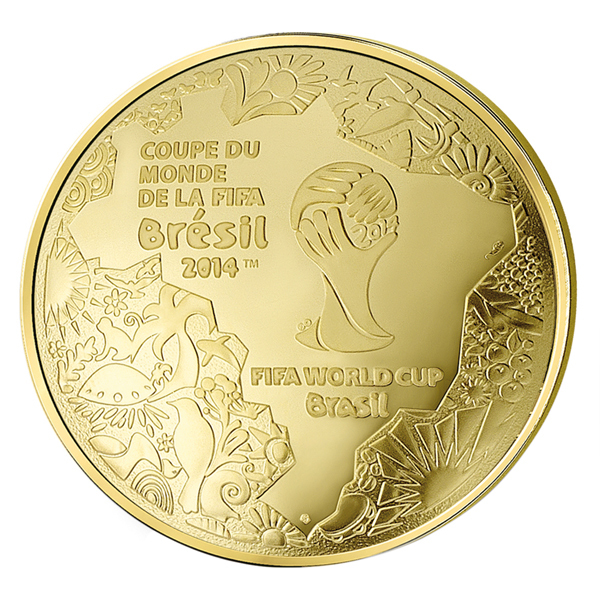 GOLD REVERSE: The image of a globe, the coat of World Champions 2010, awarded by FIFA to the Spanish National Team, the reigning world champions. On the right, the diamond and the celestial sphere contained in the Brazilian flag on a map image. To the left the denomination. 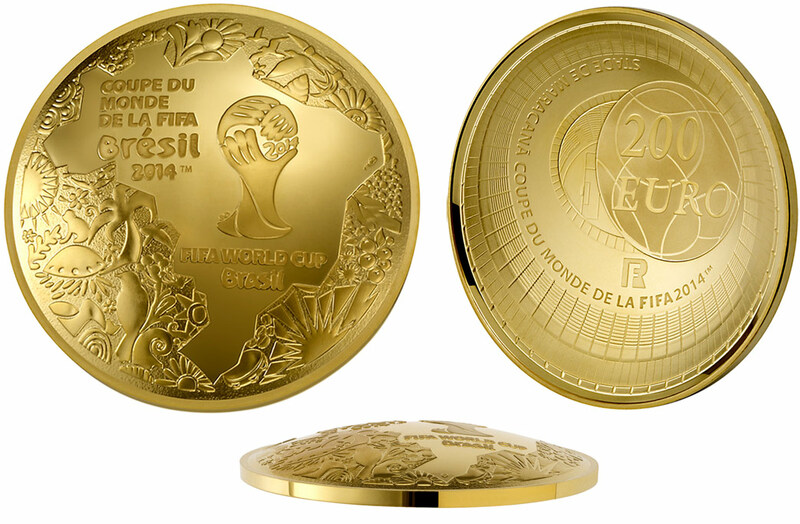 PACKAGING: You can purchase each coin in an individual case, or as a complete set with both coins in the same case. 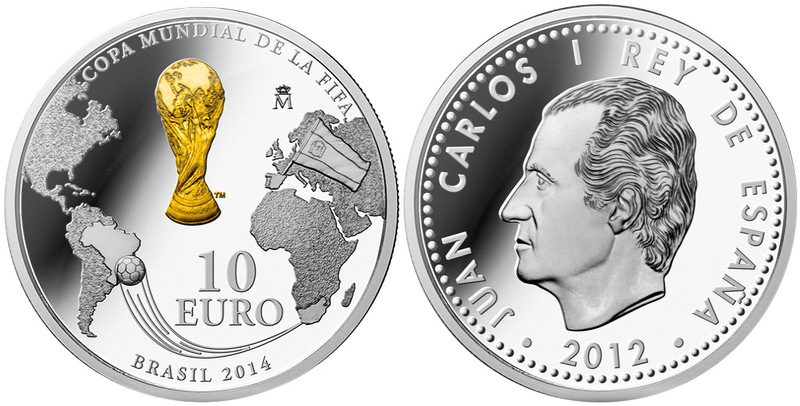 In 2014 a silver 10 EURO coin has been announced. This proof quality coin is available now and features selective 0.975 gilding. 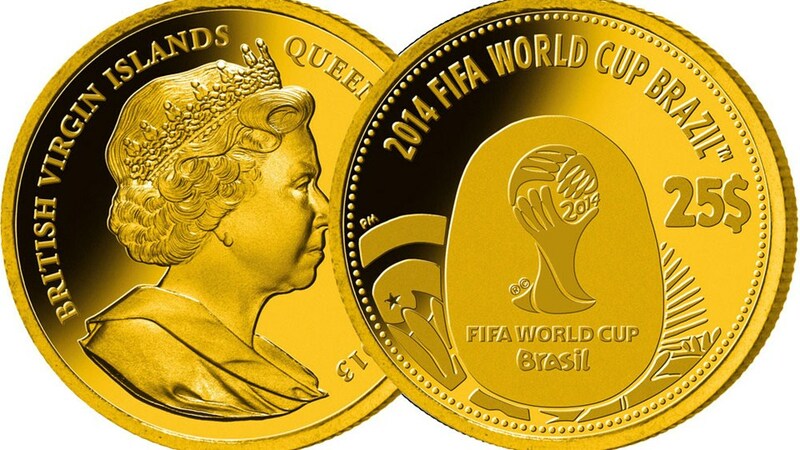 OBVERSE: has at its center a golden vertical rectangle with bath gold where the image of a football field appears . On both sides, curved motion lines ascend, widen and end up in two footballs. At the bottom , in circular orientated capitals, the legend ‘CHAMPIONS THE WORLD’ in Spanish (CAMPEONES DEL MUNDO). 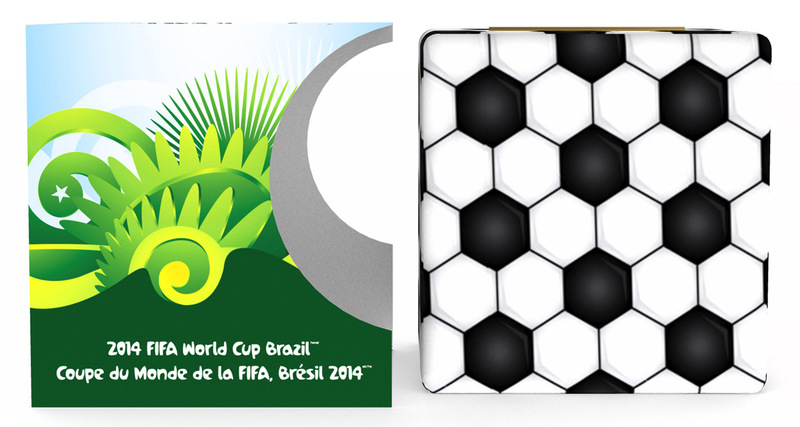 REVERSE: also featuring a gold rectangle, in this case showing the FIFA World Cup Trophy. On the left, the image of a footballer in play and on the right a goalkeeper catching a ball. 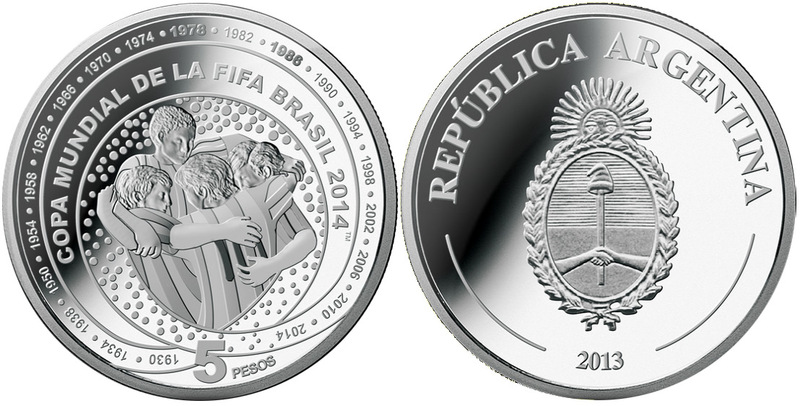 At the bottom is the denomination and at the top the inscriptions ‘COPA MUNDIAL DE LA FIFA’ and ‘BRASIL 2014’. PACKAGING: Not confirmed, but we believe it comes in a similar box to those above. ‘In 2014, Brazil hosts the final phase of the 20th Football World Cup, a competition organised by FIFA, gathering 32 nations from the five continents around what is considered as the most popular sport in the world. 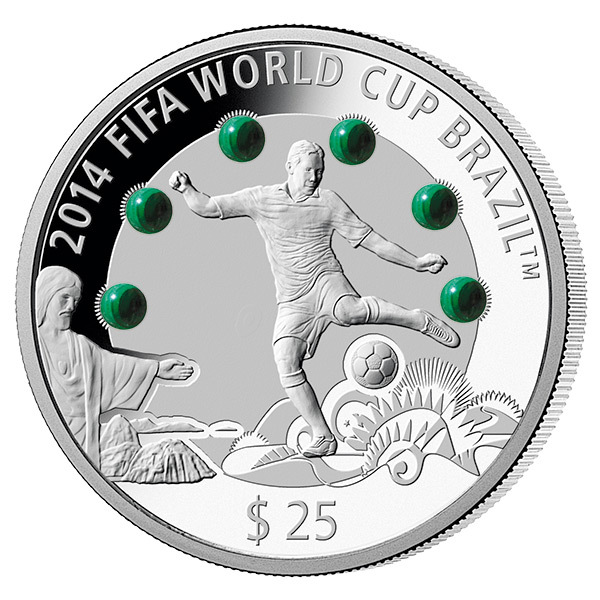 A nice design, better than many of the other coins released to mark this mammoth sporting event, the obverse has the huge statue of Christ the Redeemer either side of a globe superimposed on a football. 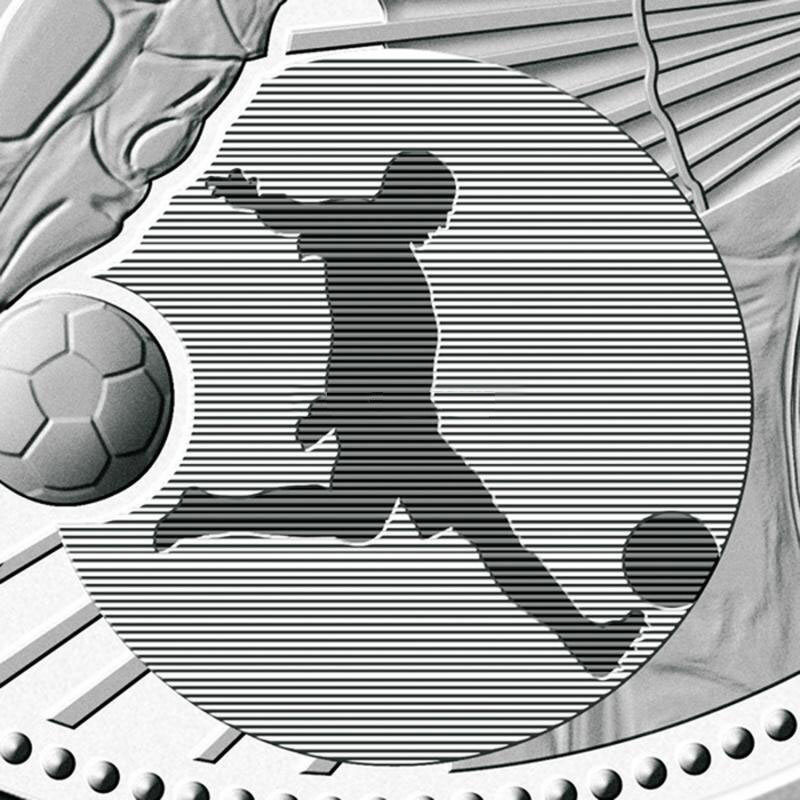 The obverse depicts a footballer in action behind goal netting. Both the gold and silver are supplied in a wooden box containing a Certificate of Authenticity, all wrapped up in a coloured shipper. 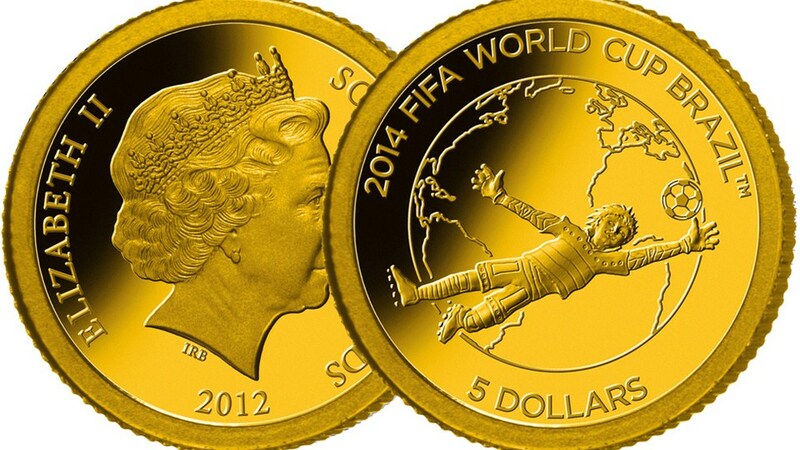 Another new World Cup coin is sneaking onto the market with a first appearance on Ebay. From the packaging and design it looks like a Mint of Poland product although we believe it’s been struck for a third-party and not for them to release directly. While we can’t put too much trust in Ebay buy-it-now prices, the price of $249 for a pad-printed 1oz silver coin with a 2,222 mintage seems ridiculously high to us. Without doubt it’ll start to be available at more places soon and the price will settle to around the $100-125 mark. Take the specification as unconfirmed at the moment and we’ll get it checked a.s.a.p. 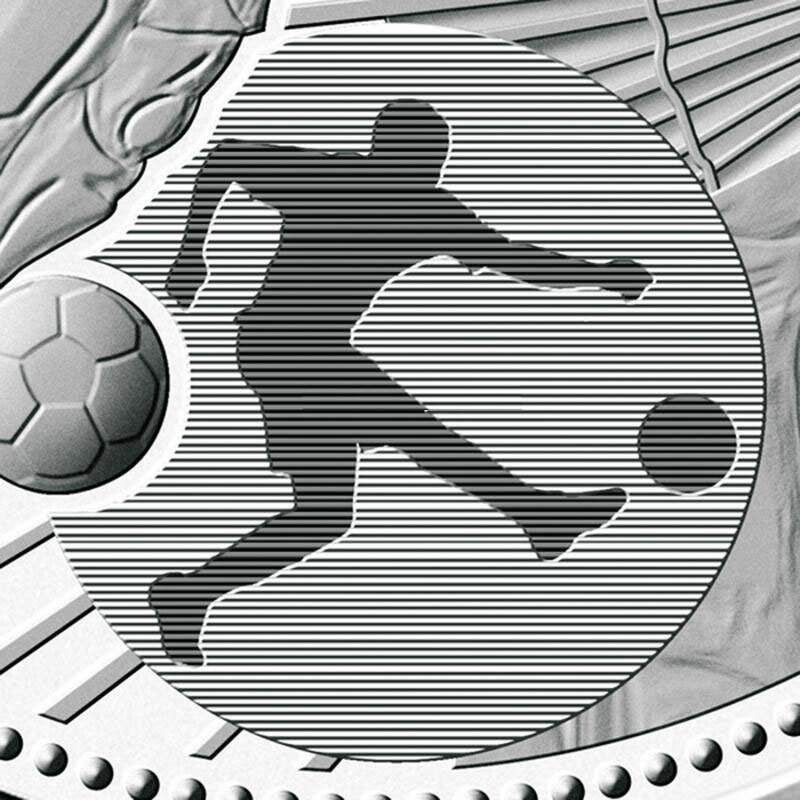 Very nice design in the middle of the reverse side of the coin with scarf-waving supporters in silhouette over a match ball. The flags of the competing countries surround it. The obverse has the Ian Rank Broadley portrait of Queen Elizabeth II in what looks like a Mint of Poland designed surround. 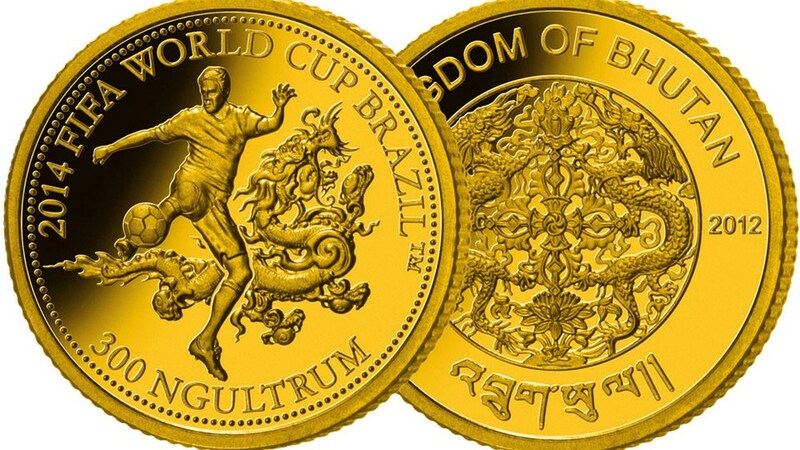 A single precious metal piece from the RCM, although they do provide a subscription to a 4-coin Brazilian issued set as well as a coloured cupronickel coin that is very well designed. In 2014, the FIFA World Cup ™ travels to Brazil, holding millions of soccer fans around the globe in its sway. Managed and organized by FIFA, the Fédération Internationale de Football Association, the FIFA World Cup™, held every 4 years, is the premier championship of the game of soccer. 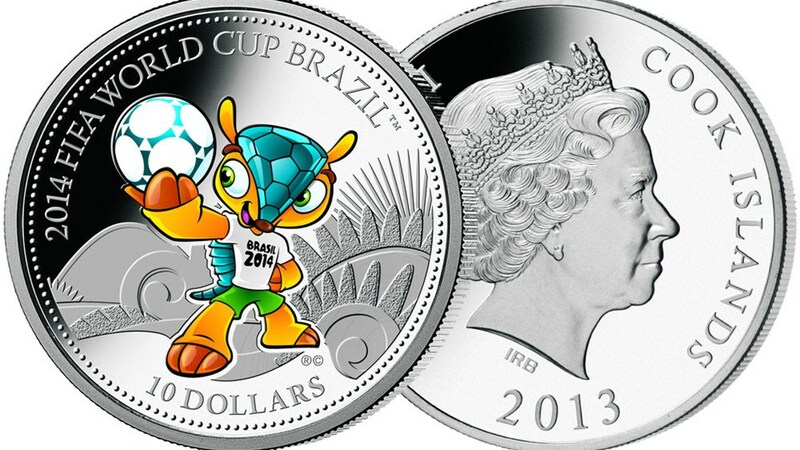 • The coin’s design was approved by FIFA. 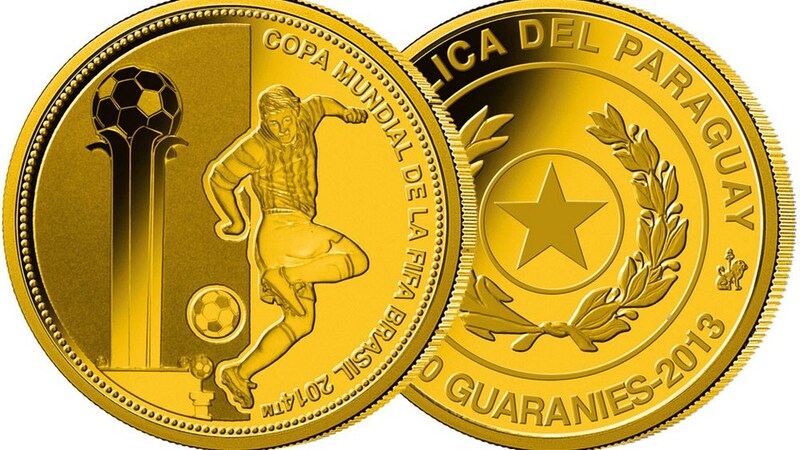 • The coin is an excellent gift for soccer fans, sports enthusiasts and lovers of the FIFA World Cup™. • A beautiful addition to any sport-themed or Canadiana-inspired collection. 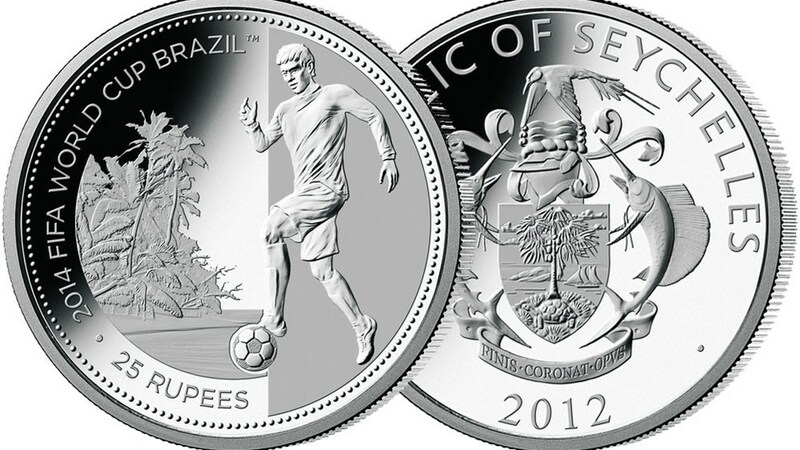 Designed by Canadian artist Greg Banning, THE coin presents a pastiche of soccer images. Dominating the centre of the image is a portrait of a smiling young player about to kick a soccer ball. The child is dressed in the familiar uniform of Canadian children’s soccer leagues across the nation, including a striped jersey, shorts, tall socks, shin pads and cleats. The image of the boy stands atop a stylized global map engraved with the word “CANADA.” Behind him are the top of the three lobes of a stylized maple leaf. Behind the leaf image, the background is filled with the shouting, smiling faces and raised arms of a cheering crowd. 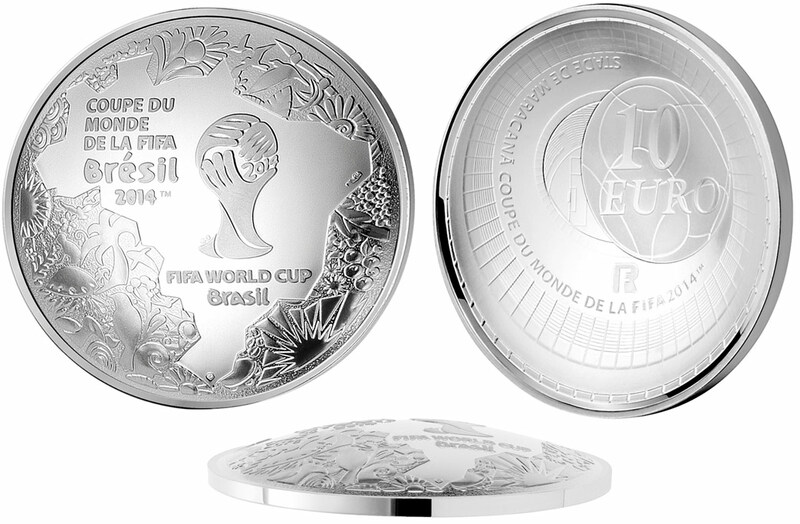 The reverse is engraved with the words ‘2014 FIFA World Cup’, ‘Coupe du Monde de la FIFA 2014′ and the face value of ’10 DOLLARS’. 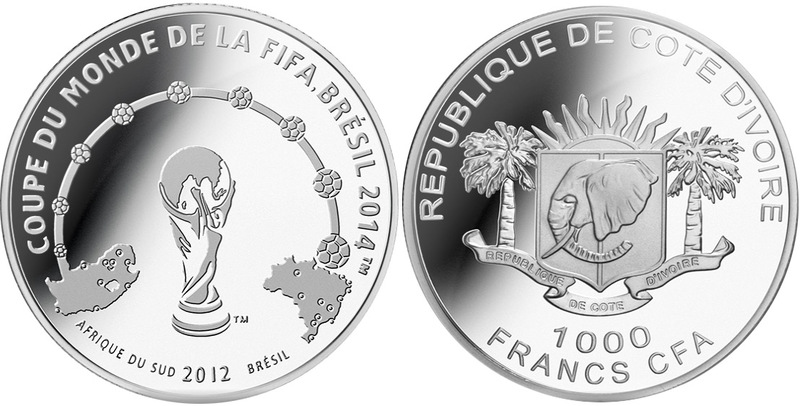 The coin is encapsulated and presented in a unique customized clamshell that resembles a soccer ball, and a graphic sleeve. 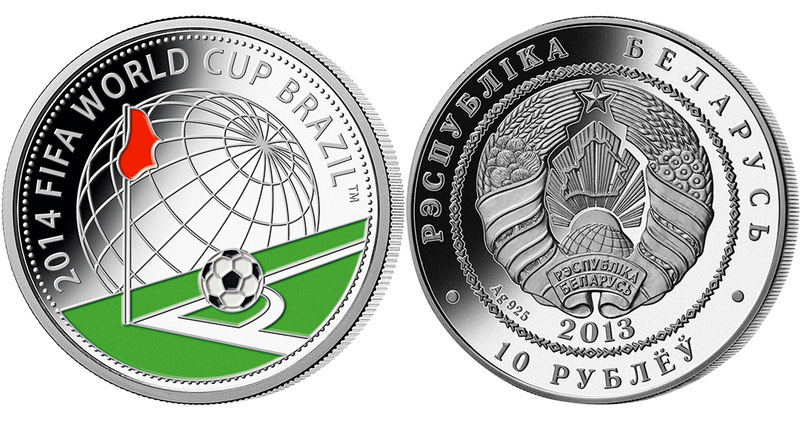 The Bank of Belarus has issued a pair of silver coins for FIFA World Cup 2014 including a large five-ounce piece with a 1,000 mintage selling for around € 250. Both pieces should be available now with the coloured coin being the smaller of the two pieces but with a larger 10k mintage and a lower price of circa € 60. Designed by Michael Schulze and minted by B.H. Mayer in Karlsfeld, Germany. OBVERSE: features the relief image of the State Coat of Arms of the Republic of Belarus encircled with a geometric pattern surrounding which are inscriptions denoting the name of the issuing country, the year of issue and face value (10 RUBLES for the one-ounce and 100 RUBLES for the 5oz). 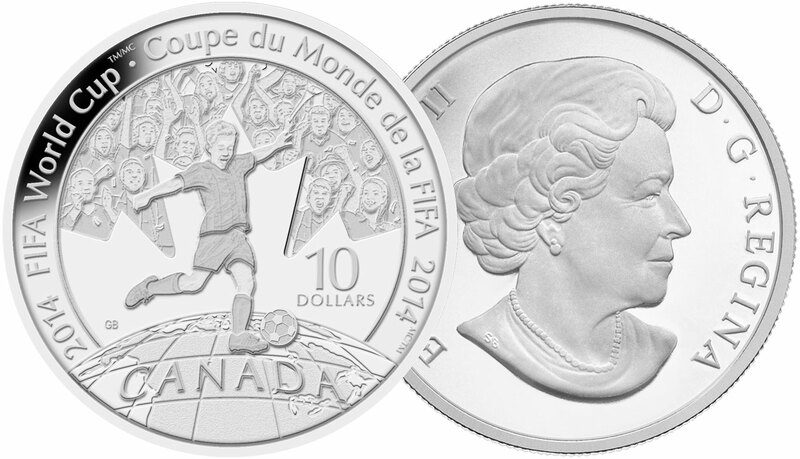 REVERSE (1oz): Coloured, it features the corner of a football field with the ball set within ready for a kick. 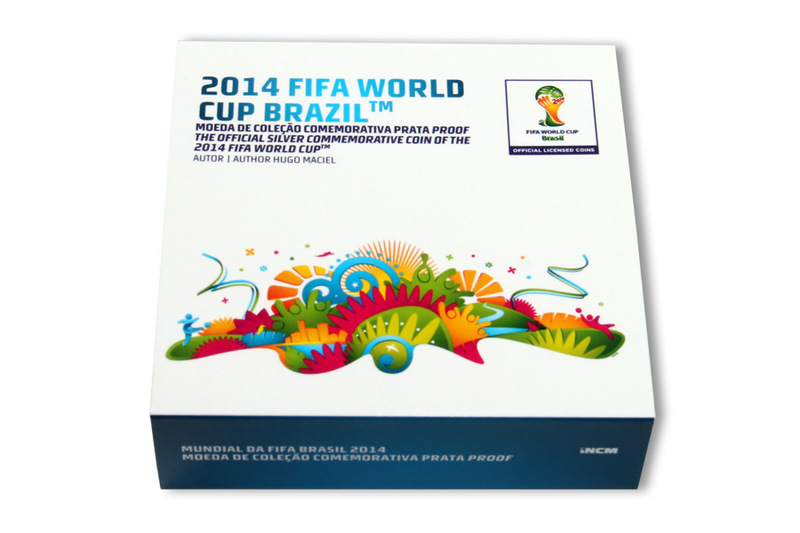 At the top of the reverse, there is the legend ‘2014 FIFA World Cup Brazil’. PACKAGING: No box, but both come with a Certificate of Authenticity. 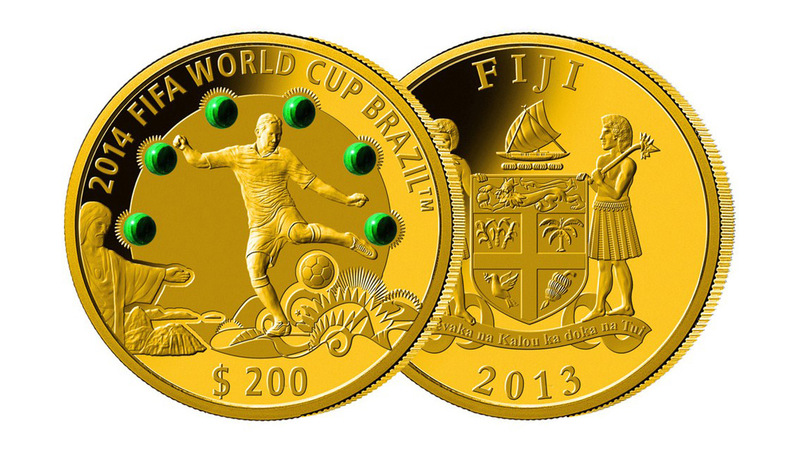 For the 2014 World Cup, Fiji has issued a pair of ultra-low mintage pieces, each of which has embedded within them six pieces of green malachite. The design remains the same with the only difference being one is gold and one is silver. We don’t know much about the gold at present, but the silver is available at a German dealer, Top World Coins for € 190. Both coins are difficult to get hold of and we believe they’re struck by the Mint of Poland who have a track record with malachite inserts. OBVERSE: features the Fijiian coat of arms and the date. 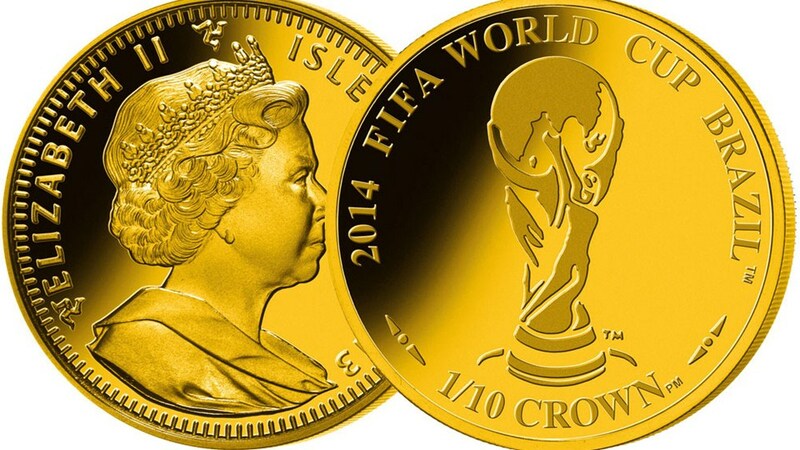 As the coin was issued in 2013, the portrait of Queen Elizabeth II is no longer present. 200 DOLLARS 0.999 Ag ? ? PROOF ? 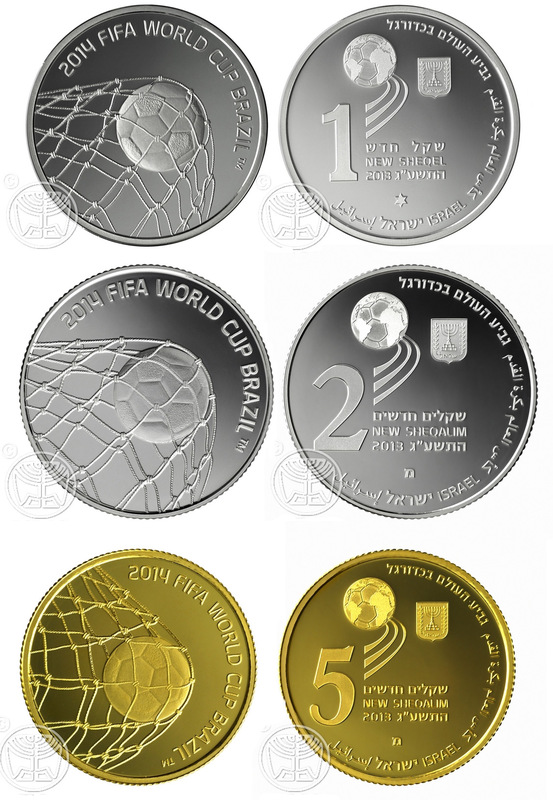 OBVERSE: The face value and words “New Sheqalim” in Hebrew and English, the word “Israel” in Hebrew, English and Arabic, the Israel State Emblem, Mint Year (2013 and 5773 in Hebrew characters). Centered in the lower part of the coin is the mint mark. Upper left is a football pictured as the globe in orbit, evoking the international nature and dynamics of the FIFA Games. REVERSE: The ball in the net, a goal, the most exciting moment of the game. 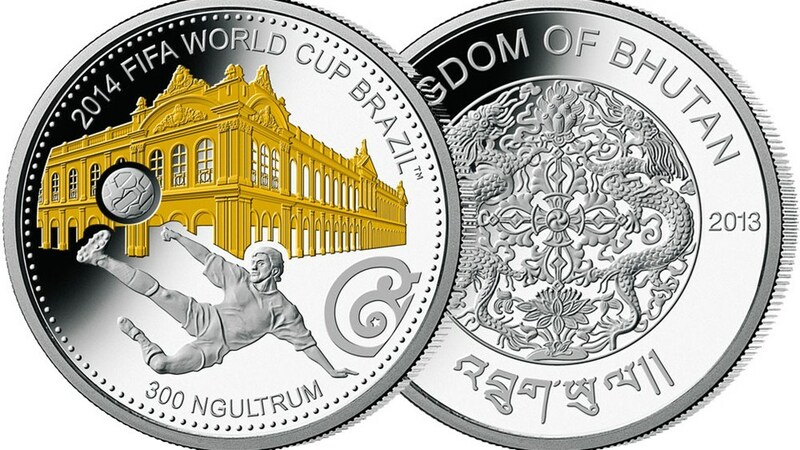 Bhutan doesn’t issue many commemorative gold and silver coins but there are one of each available for Brazil 2014. What we have are the best images we could get at present. They are minted by B.H.Mayer in Germany, a very well respected institution. A pretty standard sterling silver (0.925) coin whose claim to difference lies in the circular panel on the reverse side at the six o’clock position. It shows a crude, two-frame animation when the coin orientation is changed, as seen below, almost like a simple lenticular effect. The design of a footballer dribbling a ball on the left side, while a native Brazilian in full headgear is depicted at right. The reverse carriees the usual Ian Rank Broadley profile portrait of Queen Elizabeth, surrounded by the inscription “QUEEN ELIZABETH II, COOK ISLANDS, 2012”. The coin comes boxed and with a Certificate of Authenticity. 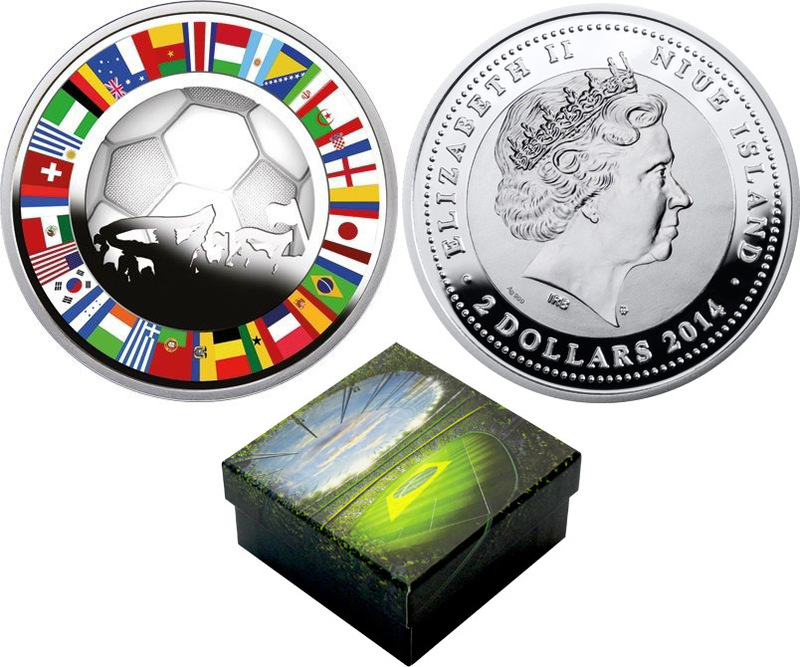 The Royal Canadian Mint often does subscription sets and many collect coins from other countries under a unified theme. 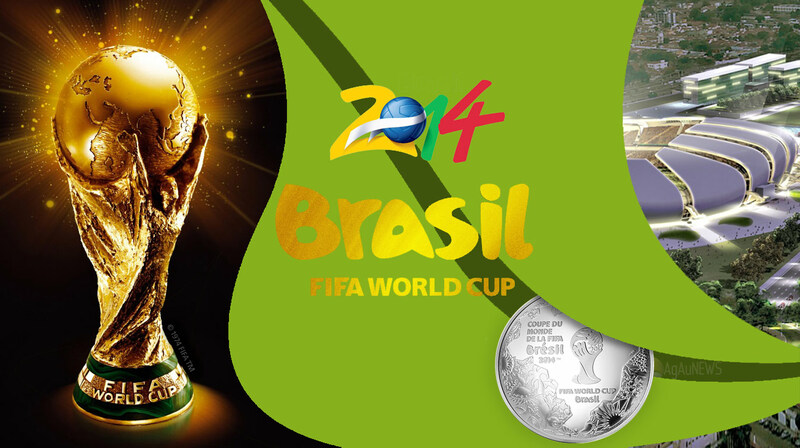 These four coins are the contents of their new ‘World Cup Brazil’ set. 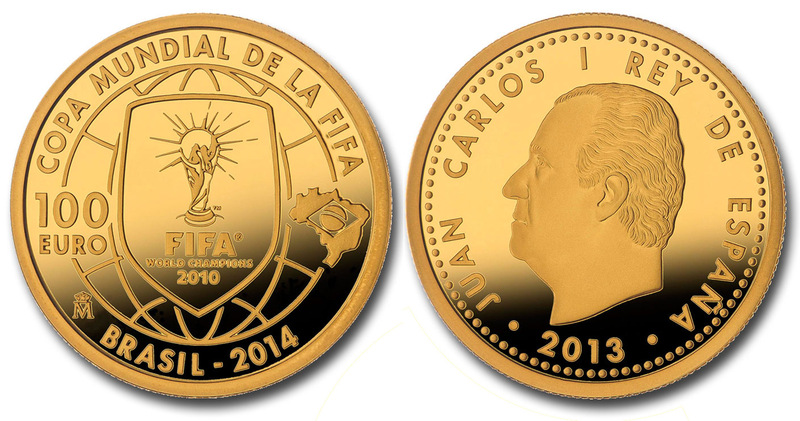 The Argentinian coin shipped in April with the others to follow at regular intervals. 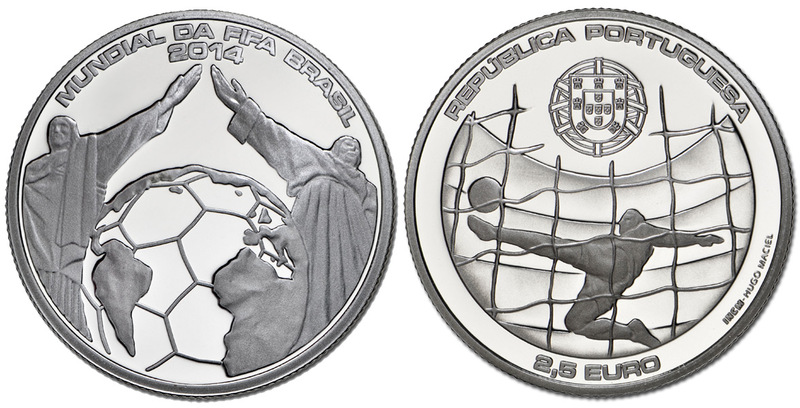 A clean and simply designed coin by artist Matej Pašalić, academic sculptor, from the National Bank of Croatia featuring the Brazilian anteater mascot for the 2014 tournament on the reverse side along with the inscription REPUBLIKA HRVATSKA (“REPUBLIC OF CROATIA”), the denomination ‘150 KUNA’, the date ‘2013’ and a depiction of the Croatian crest. 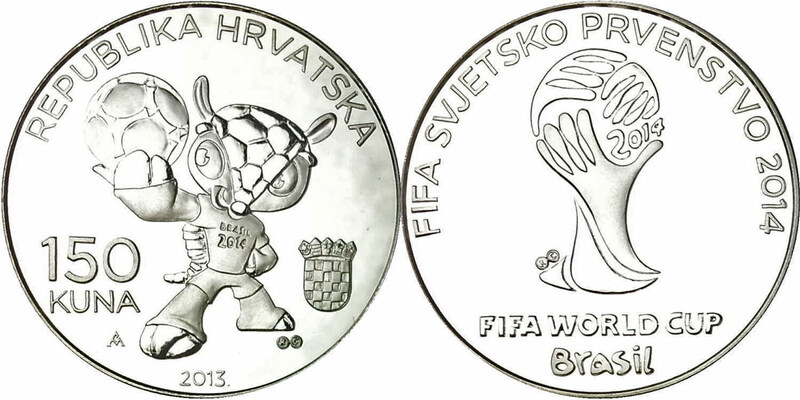 PRVENSTVO 2014″ (FIFA WORLD CHAMPIONSHIP 2014). Here we have some coins for which information is scarce, but we will be filling out what we can as we track it down.